IN 2012, I JOURNEYED with several climbing partners to an area of the Karakoram known only on satellite maps, arguably the last unexplored corner of the range. Our trek began at 11,000 feet from a lone village and ascended a canyon cut by a torrent of meltwater that told of glaciated mountains above. As we climbed higher, our eyes opened wider—to churning and sacred waterfalls, a mysterious hermitage hut atop a huge boulder, green meadows, and craggy ridgelines soaring to snowy summits. Above 16,500 feet we camped under the watch of wild sheep and bearded vultures, and I stumbled across some of the world’s highest petroglyphs. We explored untrod glaciers and summited four untouched 20,000-foot peaks. When our time was up we hiked out dizzied and humbled to have been granted an audience with an unknown land. But I knew a climbing expedition was just a brief introduction to this isolated area. I wanted to get to know the people in that village. For years I’ve been curious, haunted really, by conflicting visions of progress and native life. The lonely village from which we started our trek– I’ll call it Skichen–seemed barely connected to the modern world. Was Skichen a thriving colony adapted to the fairytale setting, or was it a forlorn outpost, scraping by on mountain shards? As my partners all left for home, I stayed on to find out. SKICHEN SITS AT THE wild edge of Ladakh, a remote region of northern India that flowers in the vacant rain shadow ranges between the Himalaya and Karakoram. In this “Land of Many Passes” the barren terrain is so inhospitable to human life that it has always turned away the march of empires. For centuries Ladakhis have lived mostly in the side canyons, tending grain terraces that, from a distance, look like green rafts of intelligent life in an ocean of stone. Since the Second World War, Ladakh’s outlying sectors have been garrisoned into even deeper isolation. 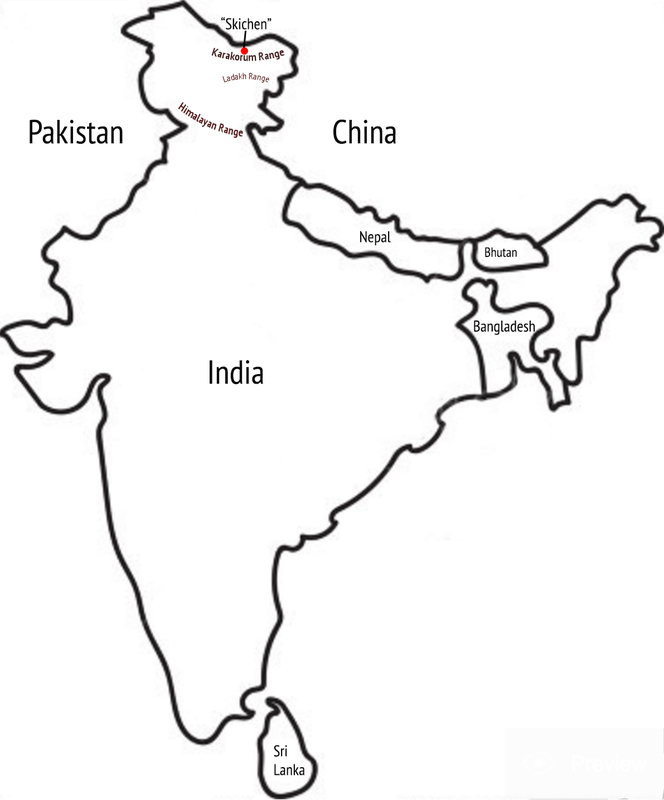 China, India, and Pakistan have warred over these areas, mainly to keep the others out of the territory they have claimed as their own. I first came to Ladakh in 1982 as a volunteer for an NGO, fresh out of college and thrilled to meet an indigenous mountain society. The NGO’s mission was to help Ladakhis preserve their traditions as the modern world moved in. I trained the locals to lead treks and to install passive solar, but I knew I had more to learn than to teach. My first lesson was to let my enchantment bubble burst by appreciating how much Ladakhis are forced to work simply to survive. Growing and processing their grain takes a full-time commitment. Add herding, spinning, weaving, gardening, cooking, building, brewing, milking, fruit drying, trading, marrying, celebrating, praying, and I soon realized a Ladakhi’s life was something no Westerner could imagine, much less envy. How could they be so happy? All of us go-ser (“yellow head”) visitors saw it. In the 1990s I led charitable treks with another NGO, and we would venture over passes to isolated hamlets where our hosts, clothed in patched homespun robes, greeted us with huge grins. They showed us with quiet pride how they fashioned flour mills, looms and cloth, copper vessels, walls and ceilings, pressed oil from apricot kernels, and more. When they performed traditional storytelling dances, we asked for the stories, but our translator shook his head, “There is so much, I have no words for it.” At one point I lingered at a rooftop eyrie, admiring apricot trees and barley fields set beneath spectacular mountains, and I realized that a setting like this would be worth a fortune in California, but no realtor could offer the family ties, community, and integrity the people had with the landscape. Still, everyone laughed together when we tourists, like dude ranchers, would totter as we carried huge loads of cut grain up to village homes. Almost every client on our trips returned to the States saying, “They have so little, and they’re so happy.” Some still tell me how they’ve come close to tears when they think about their time in Ladakh. Ladakhis carry on with something elemental that we lost long ago, something we don’t even know we ache for until we see it. I’VE ALWAYS LIVED with the belief that mountains can restore things that we have lost. The people of Ladakh inspired me to think of mountains not just as places to visit and climb, but also as places to fully inhabit. I moved to the east side of the Sierra, California’s rain shadow, where jobs are few and arid mountains run high and broad. Friends noticed how I learned to live with less before chasing to earn more. My respect for my Ladakhi friends deepened when I followed their invitation to visit in winter. Frigid and grey days dimmed spirits, and long nights dropped to 25-below. At traditional New Year’s celebrations the Ladakhis danced, raced horses, and sang, but around spare kitchen fires I learned the harsh facts about years past. A friend named Ngawang told me how hungry he’d been growing up. “Many days we had no dinner. Maybe we would have one spoon of barley flour in hot water. Some days I went to the stream and ate little fish.” Fish are taboo, and he held his fingers an inch apart; he had resorted to eating fingerlings. Ngawang grew up to elope with a poor but hard-working girl, and then was fortunate to acquire a piece of land. They built a tourist guest house and now they do well. “So you grew the barley and raised the animals by yourselves?” I asked, incredulous. At Tsering’s house I developed a chest cold that worsened into bronchitis. For three days I barely dragged out of my sleeping bag. “We call winter the dying season,” the village doctor told me. I dug into my antibiotics kit and recovered, grateful to the pharmaceutical industry. 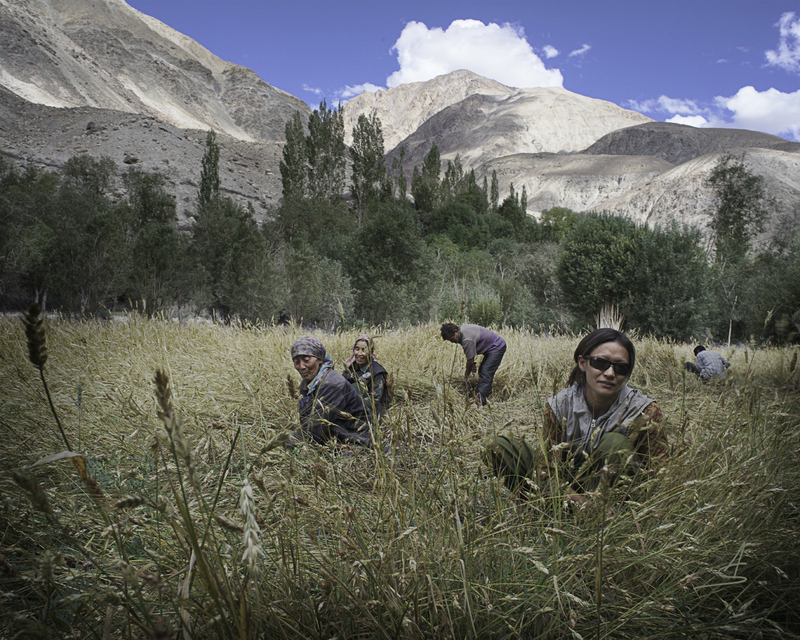 By 2012 I had visited Ladakh nine times, enough to speak basic Ladakhi and to understand many of their folkways. Still, when I approached that outpost village of Skichen to see whether I might stay over for a time, I was seeking pieces to the happiness puzzle. SKICHEN IS AN ARRAY of fields, homes, and willow and poplar groves at 11,000 feet, dwarfed beneath barren hills rising to 16,000 feet. Some 40 people live in eight homes. The closest village is a long day’s walk down-valley, though the government has recently pushed in a rough road. That glacial torrent from the higher peaks supplies the hamlet with ample water, a rarity here. Skichen’s multi-story houses are made of stone and adobe, and most have glass windows that would have come packed in on ponies from far away. (I later learned that a recently installed hydro turbine generates a few hours of electricity each night.) I approached the first villager and did a double-take at his t-shirt: I THINK I KNOW YOU FROM FACEBOOK. His name was Kunzang, and no, he had no Facebook profile. But he pointed me to a bridge across the stream to the house of Angchuk, a friendly man whom we’d all met as he herded sheep and goats by our basecamp at 15,000 feet. Angchuk agreed to board me for nine days at 500 rupees a day. He also said I could take pictures and record audio. Angchuk’s wife, Rigzen, welcomed me into her kitchen with a toothy “Skyot-le!” A wiry woman with thinning hair tinted with henna, her few missing teeth and weathered skin make her look older than her 50-odd years. But the creases in her face framed an almost permanent grin. 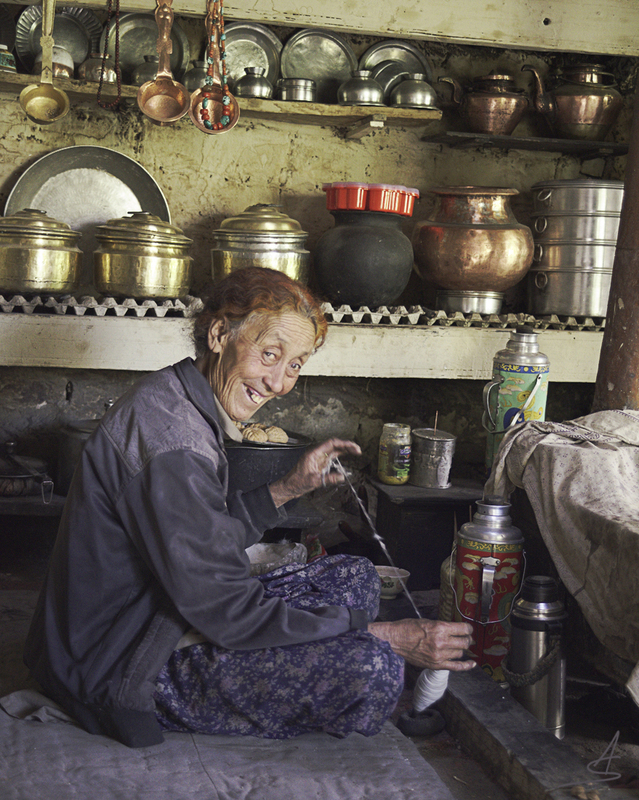 She served me butter tea, sourdough bread, yogurt, and chang, a barley home brew. After lunch I followed her and several others to gather grass for the cows and goats. I watched for a bit, and when I asked to help they said ok, probably to humor me. You grasp a handful of grass, whack it off with a sickle (not easy, because of the dull blade) and toss it into a big pile. When an area is cut one person then feeds the grass into a weave-roll that another twists with a windlass stick into a rope. They knot the ropes into tidy loads, which we all carried to the home and up a rickety ladder to store on the roof. Throughout the afternoon everyone worked and rested as they wished. Even the visiting schoolteacher pitched in. Others came and went in a fluid and seamless arrangement. The steadiest worker of all was Rigzen, also the oldest. The whole time she grinned broadly, as if she were about to laugh at a joke. Was she simply amused by the sight of me, a too-tall go-ser trying to play Ladakhi? At dusk we all made final carries to the house, then Rigzen gathered sticks for the fire, measured and mixed dough for dumplings and chapatis. Angchuk helped her prepare the meal. I was famished, and as the evening grew long I had nothing to do but to keep still, remembering how most Ladakhis would think of this as trivial hunger. Rigzen’s face was still pulled into that laughing smile. I wondered whether her high cheekbones came from her grinning muscles working overtime. I heard the sizzle of greens in a pan and my mouth watered. By the time we ate it was late. Afterwards, at nearly 10 pm, she cleaned the kitchen. Only then did I see her smile fade. But at dawn I found her at the basement tugging milk from their four cows, her grin restored. “No, very little!” she said still smiling as she removed the bucket, which contained barely a quart. She wore the same smile through her morning chores. After breakfast I followed her and a whole family crew down to a wheat field, to harvest by hand. When Rigzen sat on her haunches to cut and stack she still wore that big smile. I asked my new acquaintances if they could sing their traditional harvest work song, so I could record it. Some laughed, but Rigzen started right in to rise-and-fall yodels like I’d heard in another village years before. Half the crew joined in, sending thanks to the sky and land, the song helping them pace their bodies and spirits through the work. Harvesting in Skichen. (L to R): Rigzen, Tsiang, Angchuck, Nyorgen, and Kunzang. Later I beckoned to niece Nyorgen to let me have a go with her sickle. After 10 minutes my arm and back started aching, and I realized that though I was fit for mountaineering, I wouldn’t last an hour in the fields. As I adjusted my posture and pace, Nyorgen called me out: I was stacking incorrectly. She showed me how to lay the sheaves like shingles, with one row’s stalks covering the heads of the row beneath. Ah, the cleverness: the shingled stalks shed rain, which can ruin the grain with mould. I was relegated to pulling out volunteer peavines for animal fodder. As I toiled, Rigzen smiled, which she did the remainder of the day. And of course that evening she did most of the cooking. Was Rigzen as happy as she looked? I asked Angchuk, who told me yes, his wife is happy a lot. Nyorgen also acknowledged that Rigzen is unusually happy. When I watched her at work I couldn’t help but think, “I want what she’s having.” But what does she have? So very little. I wondered if I’d found my Himalayan guru. Rigzen’s smile soars so far above her circumstances, she’s off our happiness charts; she greets another hard day of labor as if it were a party. The great irony is that an economist would take pity and rain down solutions for the poverty she hasn’t noticed. On Skichen’s little raft she’s paddling through big mountain waves sure as if she’s touring a South Pacific Eden. I decided Rigzen is by far the happiest person I’d ever met. FOUR DAYS INTO my stay, a Buddhist monk came to visit. We all took an extended midday break to listen to the robed man teach from the honored spot by the kitchen stove. All except Rigzen. She heard much of the teaching, I’m sure, but she kept working in a corner, spinning wool and baking bread. Of the lama’s words, I understood barely one in 20, but I heard him speak of sonam, or merit. Village laity have learned to respect the Buddha and his teachings, including the faith’s “First Noble Truth” which explains the inevitability of suffering. But villagers’ Buddhism flourishes in folk traditions such as altar offerings, spinning prayer wheels, offering simple chants, and prostrations on special occasions. These traditions, it is said, prepare them for higher practices in future reincarnations. Buddhism is, I believe, a pillar to villagers’ lives, but I surmised that Rigzen grins more from work and love of her family than from Buddhist teachings. I knew what this meant. Their sons had no plans to take over the household, or to stay with them in old age. To young villagers newly able to explore the modern world, remaining in Skichen probably felt like a prison sentence. Angchuk appeared to respect his son’s choices, but with the hint of anxiety I’d expect. “If people come to the village and bring money, that would be a good thing,” he said. A day after the lama left, four of the sons showed up to help with harvesting. Rigzen beamed to welcome them into her kitchen. They bore gifts from afar, including fresh tomatoes, bottles of lager, horrible army whiskey, and smartphones loaded with pop music and portraits of Asian girls. One brought a DVD of the 2010 World Wrestling championships. The young men were surprised to see a foreigner in the home. One who knew some English asked me, “How do you like the village food? Isn’t it very heavy?” I admitted that it was. I enjoyed the thick bread and barley flour and dumplings, but I couldn’t eat as much of it as the Ladakhis, and I was growing thin. I think Rigzen somehow knew, and she and Nyorgen started serving me occasional cups of raw milk, right from the cow, warmed on the stove, a treat often reserved for infants and the infirm. I felt guilty taking more than my share, essentially from their own skimpy reserves, and I tried to refuse it. But Ladakhi protocol traditions, or zhangs, call for guests to refuse food before being pressed into accepting it. So they kept pushing the cup toward me, insisting Don-le! – “Drink it up!” – until I thankfully gave in. WHEN THE TIME CAME for me to leave I didn’t anticipate that Angchuk would reject my payment of nearly 5,000 rupees. As I counted them out, he held up his hand. “No! You are our best friend. You cannot give us money.” This was not zhangs; this was averting insult. We had shared jullays across a vast span of humanity, and as I got up to leave the gravity of these things pulled a knot into my throat. I didn’t know what to do but to return one day and pay the family some other way. “What’s the simple system?” I asked. Well, she doesn’t work for money, and she’s never clocked hours under a boss. We are trained to measure work as life’s unfortunate deficit, best reduced to zero, but Rigzen savors every moment of it. She wrests the essentials of life through her hands, gleaning from raw stone, crafting by the rhythm of the seasons, her pace determined by the steady beat of her heart. Even among her family and fellow villagers she’s the one living in the most elemental way, and she’s the happiest. Does progress doom us to exile from smiles like hers? From Healthy Living magazine to the Dalai Lama, we’re taught that the greatest joy comes from giving to others. Most of us, I reckon, are happy to give from surplus. Where does Rigzen find the heart to keep giving when she’s just a homespun robe from freezing and a fallen crop from starving? IN 2014 I BOARDED A JET at LAX to guide a small group up another peak and to visit Skichen again. Into my bags I stashed gifts for my village friends: sunglasses, photographs I’d taken of them, solar-charging flashlights, and a file for sharpening sickles. I had a long layover in Paris, and I crashed out in a chair in the transit hall. When I woke, half dreaming, I wasn’t sure where I was or how I got there. I saw a great hall abundant with modern treasures, but no one’s mind was present enough to enjoy them. Some glanced at glamorous shopping stalls, others were feeding themselves in the food court, and many were staring at screens – mostly at smartphones. My fellow travelers were here, but they were somewhere else: waiting for the next flight out, anticipating the next app to accelerate and amplify their lives. In my drifting-dream state they appeared like ghostly caricatures of modern life, entirely disengaged, biding their time in transit hall minds. I thought of Rigzen, so very alive with that big grin as she paddled her life raft in the Karakoram foothills, connected to her few family members and fewer possessions. Likely we in the West were once similarly engaged some time ago, but I wondered when and if we would ever know that kind of grin again. I scanned through my own life, and came to climbing. Of course a Ladakhi would ask, what befuddled irony, what silly common sense, would send “modern” people out of their way onto vertical walls and faraway mountains? It’s true, we take big risks and work far harder in climbing than we ever would at our jobs. I remembered pulling into the first of the Stoveleg Cracks on the Nose of El Capitan and feeling my hands and feet slotting nicely into the polished white fissure of the up-beckoning groove. Higher I went, placing no gear so my partner could enjoy the pitch without fear of a pendulum fall. It was risky work and it was scary, but I was sure of myself and I grinned in a moment of Rigzen-like unity with time and place. I also remembered roaming up the complex north flanks of Great Trango Tower, where my partner and I had no way to know our route except by climbing around this and over that, and suddenly we were high among the Karakoram peak-gods, our bodies and souls dancing in the fairytale landscape. Climbing quests take us out of the transit hall mind and put us into right here and right now. Has Rigzen ever lived any other way? Nowadays I seldom climb, but I have a son. My Himalayan guru says without words that my job is to find that grin of being human in everyday, less extreme moments, and pass that on to him. He’s found pretty good engagement in baseball and cello, and when I see him tracing the path of a ball through his bat, or channeling Vivaldi through his bow, I know he’s starting to get it. FROM THE TRANSIT HALL in Charles de Gaulle Airport I continued to Asia, and a few weeks later I crossed the wooden bridge and walked the stony path to Rigzen and Angchuk’s home. Rigzen shuffled out, surprised and happy to see me, but she wasn’t smiling. “I’m sick,” she said. I expressed my concern for her, and asked if Angchuk was home. 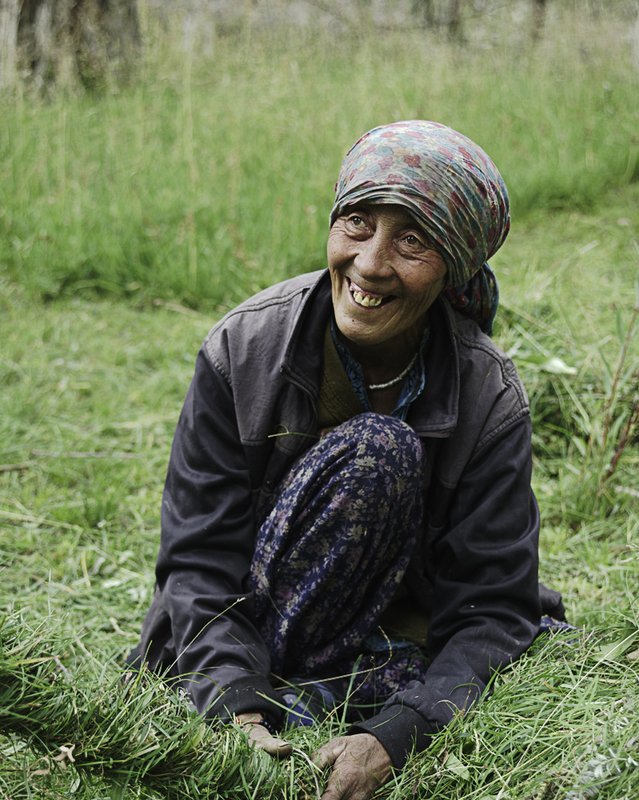 “Angchuk is herding the village’s sheep and goats in the mountains. Maybe he will be back tomorrow.” She managed a weak smile and offered tea. Later I walked into the hills and found Nyorgen and some of the younger villagers harvesting grain to the tinny sounds of Bollywood music playing from a mobile phone. The music seemed to call them to someplace far away. Rigzen perked up when Angchuk returned the next morning. He and I then walked together to a new homesite a mile away, to prepare adobe bricks for their eldest son, who would return from the army soon to marry and to build a new house. 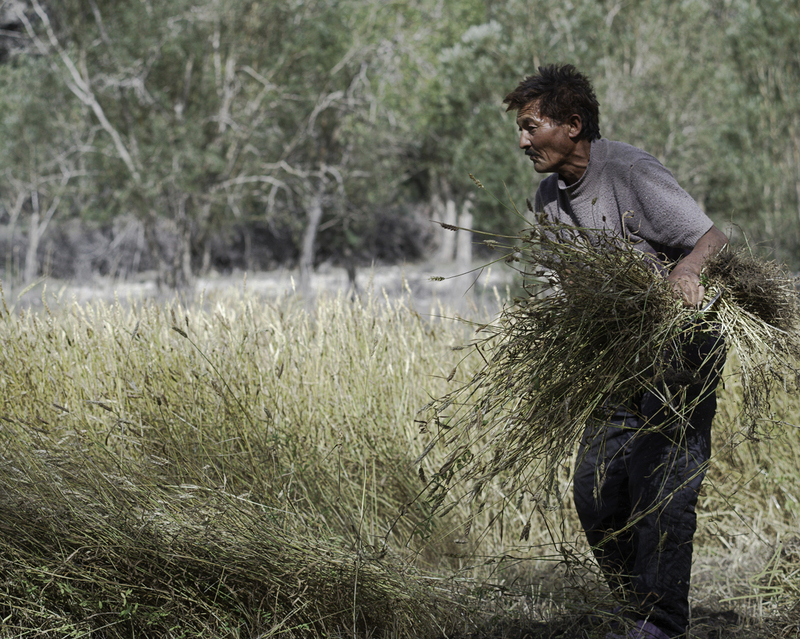 The following day I followed Angchuk and Rigzen into the fields to harvest grain. I fell into collecting peavines, my old job. Angchuk talked about how Skichen was one of the last villages without a threshing machine, a gas-powered beast to replace the old way of walking cows and donkeys in circles on the crop. He said that by next year they would likely have one. Rigzen smiled and said, “Ma gyalla duk,” that would be a very good thing. Alpinist, international mountain guide, author and photographer Andy Selters has chronicled his adventures in books and periodicals for the better part of four decades. The Wall Street Journal called his history of North American mountaineering, Ways to the Sky, one of the top five adventure books of all time, and it has been honored with multiple awards, including the National Outdoor Book Award and the Banff Centre’s James Monroe Thorington Award for the Best Work of Mountaineering History. 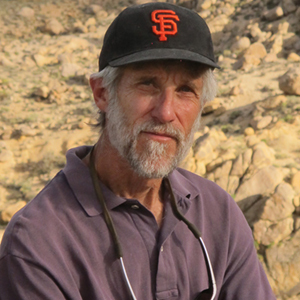 Selters has also authored or co-authored essential guides, from the best-selling Glacier Travel and Crevasse Rescue and The Mount Shasta Book, to Wilderness Press’s original guide to the PCT, The Pacific Crest Trail. His landscape and adventure photography is exhibited in galleries around California. When he is at home in the Eastern Sierra, he teaches T’ai-chi and coaches youth baseball. He is currently at work on a memoir, which he says is focused on dreams and nightmares both coming true. 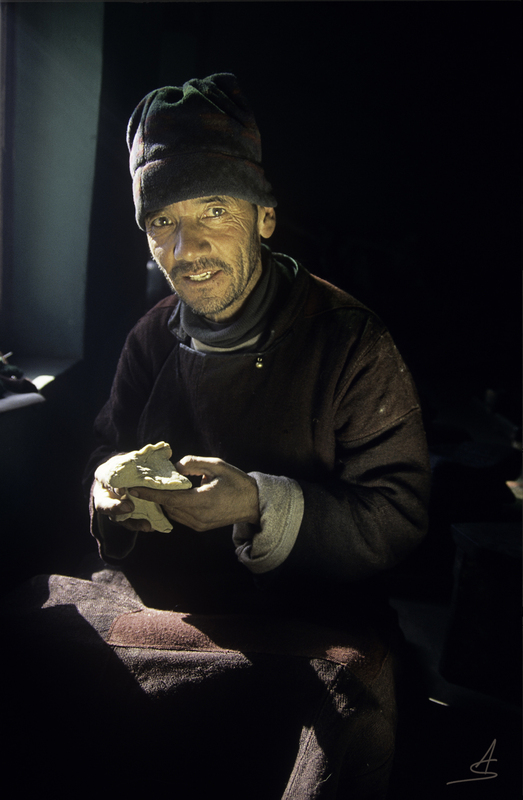 Selters’ journeys in Asia include first ascents in the Karakoram, Garwhal, Khumbu, and Langtang areas. If asked to recount his most memorable excursions, however, he’ll mention two: his trek from Nepal to Mt. Kailas tracing the path of the Buddhist and Hindu pilgrimage, and a mountain biking journey in the ‘80s from Lhasa to Kathmandu. As this article goes to press he is leading another small group to Ladakh. Selters’ website is being redesigned, but you can read his thoughts about mountains and life on his blog. Andy: Beautiful, as usual. Thanks. Beautiful piece Andy. Chris and I would love to visit some day.